What an incredible whirlwind of crisis from seven foul winds around the globe. Most emanate from Europe, which is far from its climax in crisis. Three steps will lead to full blown eruption, the first Italy with rising bond yields and a bank run, the second Spain with rising bond yields and admission that banks are far more insolvent than recognized, and third the failure of all three largest French banks as the principal swine creditor. In fact, a great split has occurred, as France has been cut off from the future world by Germany, which looks East to Russia and China. The Berlin leaders will not be needing French squires to carry their bags, but instead will watch as Paris becomes the appointed leader of the PIIGS. As the most exposed banks to Southern European sovereign debt, pig slop of immeasurable weight is tied around the laced Parisian necks. The common link across the Atlantic pond is derivative corruption. The Europeans are doing their best to force feed a convenient but cockeyed definition of a debt default event. The Americans resort to old fashioned theft, calling it missing funds, blaming the crisis, while breaching the sacred segregated client fund directive. The crisis struck the US shores with the hidden JPMorgan chamber implosion and urgently needed theft, whose visible face is the MF Global heist and failure. My belief is that JPMorgan used its MFG patsy to anchor derivative trades, that just happened to be long sovereign debt in Europe. Nobody in his right mind, even a Corzine of GSax pedigree would place such large wrong trades unless obligated as a syndicate cog in the machinery. The big US banks will sit on the bankruptcy boards and decide the fate of victim accounts without client representation in a full scale insider exercise that makes a mockery of justice. That has been the American norm. Witness the middle stage of the collapse of the COMEX, which has lost all trust as segregated client cash accounts vanished in a vast ongoing commingling campaign. One must conclude that JPMorgan must have really needed the money. The thought of a Madoff Redux comes to mind to the alert but weary. The MF Global vanished funds will eventually be measured over $3 billion. The actual Madoff pilfered funds totaled $150 billion, triple the more palatable figure often quoted. The locations of the missing funds have commonality, the ruling untouchable syndicate. Gold smells the destruction of the monetary and banking systems, aggravated by Western recession. Gold smells new application of debt to repair old failed debt structures, where central bankers chase their tails. Gold smells the vast reconstruction project for the giant Western banks, not too big to die of internal rot, only too big to let fail by a gavel. The twisted bizarre attempt to control commodity prices by presiding over a series of negligent policies is coming to an end. The Western recession is too much for the insolvent banks to bear. The US banks have real estate debt rot, but the European banks have both real estate debt rot and PIIGS debt rot. In truth, the US banks share great risk from across the pond. The thrust of the French-based central bank over the pen of swine cannot be far from a formal announcement. Not quite what the highbrow French had in mind for leadership. Better to rule in clubmed pig slop than serve as lackey in the teutonic core. The death of the monetary system has its main motive in the refusal of governments either to manage finances responsibly or to repay debt in the usual manner. They accumulate larger debts and plan the swindle of inflation in return. Their only viable approach, hardly a solution, is to inflate debt and thus to reduce its burden.Creditors feel betrayed, seek defensive measures, like to cut off credit and loan up quietly on gold, while lying about reserves. The creditors are not involved in the important decisions to debase the currency. Those decisions are made unilaterally by the debtors. A run on the US Treasury Bonds is occurring by angry foreign creditors. The USDollar is kept afloat by some secret corners. The pages of history are littered with examples of government debt default, but more often with the public paying for debt reduction in basic price inflation. The debts accumulated by many governments large and small cannot be repaid. History shows that tangible assets like Gold & Silver protect from the worst economic consequences. For the current financial crisis, only one pathway seems likely, although painful. The system cannot be remedied, only patched over. Vast inflation is the only politically viable method of repudiating these unmanageable obligations. Of key importance is the velocity of money in determining whether or not inflation turns into hyper-inflation, which requires final demand not to falter badly. Hyper-inflation requires sustained activity like an engine, which cannot stall. Higher price inflation is coming like night follows day, but probably not an extreme case. It will be painful though, since the cost structure will be the primary damage center. The US Consumer Price Inflation runs at 11.1% in the honest broker Shadow Govt Statistics calculation, which is painful enough. The retreat is well along, the isolation to the hyper inflation machinery well along, the sovereign bond ruin well along. The Fed was hit with withdrawals of $83.3 billion on November 2nd, the largest withdrawals coming from its deposit accounts. This single day removal was the largest since February 2009, and not associated with quarterly tax payments. The withdrawals are being demanded by countries angered by USGovt policies, like China, Russia, Latin American, and other Asian players. It is only the beginning of a bloodletting. A run on USTBonds is in progress, covered up by Quantitative Easing and Operation Twist, programs given innocuous names but integral to the grand debasement process underway. The bond exodus is complemented nicely to significant removal of depository funds from the major banks in the 'Move Your Money' movement. Despite pleading by the big US banks for customers not to extract their money, impressively 650 thousand customers moved a total $4.5 billion dollars out of the big banks. The damage done is 10x to 20x, due to fractional banking practices. The funds went into smaller banks and credit unions in October. The entire concept of Too Big to Fail is a hangman's noose around the US banks and the banking system. The debate over cause or effect is curious. The related propaganda is obscene, if not comical. The smear campaign against gold will turn absurd, before the USDollar breaks permanently on the world stage, in the form of rejection in international commerce. It is called the Dollar Kill Switch, and it will be applied to the crude oil market. Conformity with the Too Big To Fail doctrine is synonymous with the path to systemic failure. Charles Hugh Smith sees the destructive force clearly. The absent liquidity of the biggest Western banks assures the systemic failure itself. Smith wrote, "The irony is that the propping up of a deeply intrinsically pathological and destructive financial system is not saving the economy, rather it is the reason the economy is imploding. The Big Lie technique of propaganda is to reverse the polarity of reality: we are told up is down until we believe it. We are told that liquidating the overhang of bad debt, leverage, and hedges would destroy the world as we know it. The truth is that keeping the zombie system from expiring and covering up the corruption with propaganda is actually destroying the world as we know it. Thus the collapse of the current financial system of central banks, pathological Wall Street, and insolvent banks would be the greatest possible good and the greatest possible positive for the global economy and its participants." The G-20 group actually suggested that Germany donate a block of gold reserves for European banking system stability, as in to fortify the stability fund. Obviously the Germans told them to get lost and mind their own business. The German nation has been the ox & yoke to pull the Southern European cart for a decade. They have had their fill of seeing savings drained! The emerging nations showed a mix of chuptzpah and ignorance. Look for the PIIGS nations instead to forfeit their central bank gold in the next several months, part of the Chinese discounted purchase of sovereign bonds. The Chinese are not stupid, careful to put hooks in the deal. In a bold stroke, the G-20 finance ministers actually demanded that German Gold reserves be used to backstop the EFSFund for bank bailouts. The backward irony of the story is that Germany will in no way whatsoever hand over Gold bullion to stabilize a system it finds revolting on a beneficial one-way street. In doing so, the G-20 Ministers actually legitimized Gold as the premier asset. The fund seeks EUR 1 trillion but in reality needs EUR 3 trillion, possibly supplied via leverage. Much confusion has circulated around the story, not fully confirmed. But Reuters cited that, "The Frankfurter Allgemeine Sonntagszeitung reported that Bundesbank reserves, including foreign currency and Gold, would be used to increase Germany's contribution to the crisis fund, the European Financial Stability Facility (EFSF) by more than 15 billion Euros ($20 bn)." The recipient of the alleged transfer would be the most insolvent of global hedge funds, the European Central Bank. One must suspect that no pledge was made, and a trial balloon was floated. It was promptly shot down. Germany has lost its appetite to make huge annual donations to support an unjustified standard of living for Southern Europe, which grossly lacks industry, a strong work ethic, and ability to collect taxes. Those nations abused the low Germanic interest rate, built housing bubbles, perpetuated young pension benefits, permit tax evasion, and face ruin. Germany will no longer sacrifice Euros at the foot of any PIIGS altar, plainly stated.Conclude that the EuroZone, the Euro Central Bank, and the European Financial Stability Facility are all dead broke and insolvent, and worse, have zero credibility in the capital markets. 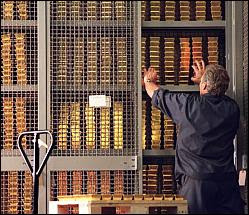 The real ugly controversy comes soon when collateral placed in return for grandiose aid will be lost, including some central bank gold bullion. The European Commission has no voice either, having pandered to the bankers. The biggest and most important danger signal for complete eruption of the Eropean financial crisis is the Italian sovereign bond. Their yield surpassed the 7% mark to sound great alarms, completing a Jackass forecast over the last several months. This level is the recognized crisis signal, the call to arms, the call to remove deposits, the call to demand collateralized loans. Their sovereign bond yield has zoomed upward in response to higher margin requirements. Italy is the next Greece, which was a crisis prelude. Italy scares the American and European central bankers witless. The Italian Govt Bond yield remained for 40 days above the 5% mark before it hit 6% two weeks ago. Its rise has accelerated, as the panic widens. The Italian yield suddenly surged past 7% with haste last week, reaching 7.5%, setting off shrill alarms.The Italian leadership is in question, its Prime Minister to be a victim. The 10-year yield went below 7% only because of heavy emergency buying by the Euro Central Bank, against their stated wishes. The Italian banks are far weaker than they reveal. The next PIIGS domino is soon to fall, for certain to take down Spanish Govt Bonds also. The new head of the EuroCB, the resplendent GSax pedigreed Mario Draghi, must cover the debt or watch the European Monetary Union crumble in a sea of fire. The central bank must make overt commitments of magnitude. If the crumble happens upon inaction, expect 20 Lehman events with numerous bank failures, starting with France. The conflagration would extend to London and New York. Barclays has declared that Italy is finished kaput. The next Greek ruin on the plaza square is happening in Rome. The bond market is rejecting Italy loudly. Italy has dragged its feet for two months, rejecting warnings, refusing budget cuts, while its prime minister has given defiant messages loaded with denial. He even accused financial journalists of causing a run on their bonds. Time has run out on Italy. Watch for France to catch the viral contagion, being a major creditor. The Euro Central Bank is the only buyer of Italian Govt Bonds. They are the focus for action. When Italy erupts, it will spread to Spain first, and then quickly to France as its primary creditor. The nation of Spain is not in the news much at all, but it will be next year, just like Italy with the same type of problems, but compounded by a bigger housing bust. The research staff at Barclays in London has declared that Italy is formally finished and cooked, as they put it "Italy is now mathematically beyond the point of no return." The Greek tragedy has finally struck Italy. Expect violence on the streets of Rome and other cities, an Italian tradition where innocuous brands of communism have splintered roots. An invisible bank run is occurring in Italy. Their banks are trapped, attempting to de-leverage on a perilous tightrope forced by tightened bank reserve requirements. They have developed a big dependence on Euro Central Bank funds. The Credit Default Swap market indicates an expected Italian default. Next the bank deposits will exit. Italian banks have grown overly dependent on the European Central Bank. They borrowed EUR 111.3 billion (=US$152 bn) from the central bank at the end of October, up from EUR 104.7 billion in September and a smaller EUR 41.3 billion in June, as per Bank of Italy data. The five biggest lenders accounted for 61% of the country's draw on ECB funds in September, double that of January. The banks include UniCredit, Intesa Sanpaolo, Banca Monte dei Paschi di Siena, Banco Popolare, and UBI Banca. These distressed banks must reduce their debt load in a highly dangerous bond environment marred by distrust and volatility. The decline in Italian Govt Bonds has rendered great damage to the private banks, reducing their reserve ratios and eroding loan collateral devoted to support regular business credit. Even Citigroup chief economist Willem Buiter recognizes the extreme risk and dire nature of the situation in Europe. He said, "I think we have maybe a few months, it could be weeks, it could be days, before there is a material risk of a fundamentally unnecessary default by a country like Spain or Italy, which would be a financial catastrophe dragging the European banking system and North America with it. So [the central banks] they have to act now." Look for enormous Dollar Swap Facility usage for covering PIIGS bonds, in particular from Italy and Spain. The French Govt Bonds will be next under attack, like in January. Their yields remain low, but they are rising, and the Bund spread is widening. My guess is that the swap facility is already being tapped in heavy volume, on days the Euro currency rises especially. The Italian & Spanish Bovt Bonds are in big trouble, but the sleepy story is how France will soon join the PIIGS as the leader in the toxic sloppy pen where monetary paper feces spews openly. Some heavy damage is being quietly done on French bonds, where the banks hold much of their own national debt and the toxic Italian debt. Some claim it is game over with Italy on the ropes. My view is that the game is almost over, as the Italian debacle has spread quickly to Spain. But the main event in the recognized implosion is the sudden failure of all three of France's big banks. When Societe Generale, BNP Paribas, and Credit Agricole all go bust in a sudden burst wave of insolvency, illiquidity, and recorded losses to their artificially lifted balance sheets, the game is truly over. Then and only then, the great reconstruction of the European banking system will begin, complete with $3 trillion in freshly printed money. The Gold market comprehends this fact, and anticipates it fully, with patience. The MF Global corrupted chaos has put a new log in the golden road. FRAUD OR JPMORGAN RUPTURE ??? MF Global is a more visible and flagrant breach and desecration than the Madoff Fund fraud and theft. The total missing Madoff funds was reported to be $50 billion, when the actual total was closer to $150 billion. The MF Global missing funds are reported to be $650 million, when in reality the total is closer to $2 to $3 billion. MF Global has located $658.8 million in customer funds in a custodial account at JPMorgan Chase, which contained a total of $2.2 billion as of October 31st, including both the MFG money and customer funds, pure commingling of funds. This is a smoking gun certain to go unpunished. My belief is that JPMorgan stole the easily accessible funds placed too close to the action. Harbor doubts that CEO John Corzine will be indicted or serve prison time. The FBI is on the case. Their investigation will most likely be as effective as with Madoff, and recall they protected Goldman Sachs three years ago when a Russian man snatched the Unix software used by GSax for insider trading. It viewed incoming orders on the NYSE microseconds before the orders were executed. The FBI arrested the man, the illegal trading trail went cold, and the venerable firm continued doing God's work. In my view, the MF Global case will render irreparable harm to the US financial system on the commodity side. Countless professional traders and their firms recognize the threat to segregated accounts and their sanctity. Trust is gone, and so is their money. No new money will enter those tables. Safeguards did not merely fail, they were abused once more in a long list of fraud events. The Commodity Futures Trading Commission has failed on the job for the public, while doing an excellent job for the syndicate in power led by JPM and GSax. The next sham charade will be the big US banks serving on the creditor committees to oversee dispersal of funds that they were not able to steal already. JPMorgan is the agent for a $1.2 billion syndicated line of credit to MFG. It was named to the committee despite also having a $300 million secured loan against the MFG brokerage unit, a position pitted against other unsecured creditors in an obvious conflict of interest. JPMorgan slapped a lien on MF Global assets in an audacious maneuver. A formal dance is in progress, where the public is amateur. Lack of cooperation has been given by MF Global so far. Witness a possible hidden derivatives meltdown, as the European implosion has a conduit to the United States. With inter-bank lending so scarce, many Wall Street banks extended heavy loans to the distressed European banks in the last couple months. The story is not told that way, only as a large financial firm failure run by an ex-Senator and ex-Governor, a fallen pillar in the financial crisis. What has happened could be a critical step toward the ruin of the COMEX itself, and its transition into a Cash & Carry operation for precious metals. The reins holding back Gold are slowly vanishing or being discarded.